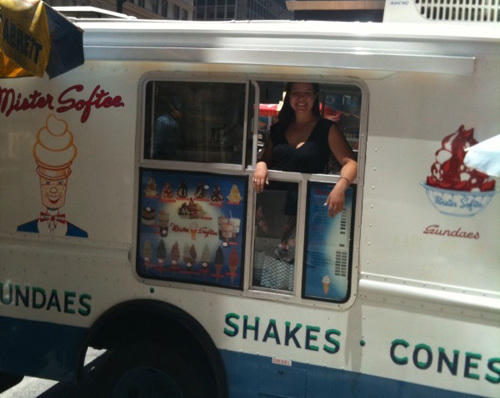 Now that all of her vending paperwork is in order, Profiled Midtown Lunch’er “Chrissy” (aka Miss Softee) is officially back on the streets and parked right now (in a brand new truck) on 45th and 5th (UPDATE: She is moving to 39th and Broadway.) Today’s specials are “gimme s’more” and potato chip chocolate dip cone (if you like sweet and salty combo, this one is for you!). Plus if you tell Miss Softee the name of her old truck from last year, she’ll give you a free cone until 4pm today (hint: it’s posted somewhere on this page). Homemade baked goods and baby cones are promised for later this week. Keep tabs on Miss Softee via twitter or the ML Twitter Tracker. Posted by Brownie at 1:15 pm, June 15th, 2010 under Miss Softee. I’ve been waiting all summer for my potato chip chocolate dip cone….and i got it today…so happy Miss Softee is back and rolling. itsa miracle! that’s the closest midtown food special EVER. off to get dessert before lunch. I threw away half of my food so that I can have your ice cream. As opposed to finding a needy soul who wouldn’t mind having your leftovers as the only meal they’d eat that day? lol okay it in my garbage bin if you want it. First time having the chip chocolate dip cone, how do you keep the chips from falling off? Just went by there and gave the name. So glad she’s back!!! She made me one of the best cones I have ever had. Welcome back, Chrissy!! Will stop by soon, will you be at 48th and 5th in the evenings again? r.i.p. maddy, i never knew ya. finally had the pleasure of visiting with miss softee and having the renowned potato chip choco dip yesterday pm. while the cone was nice enough, meeting her was the highlight. can’t wait for the baked goods. @viktor: chips falling off is unavoidable hazard. just don’t be wearing anything nice. Yes, Miss Softee is really nice (not just eye candy but also her genuinely sweet attitude).